In this article, I want to give advice to importers of custom products (i.e. not “off the shelf”) who just spent many months getting a new product development right and that are ready to launch manufacturing in China. Chances are, they did not work with a big factory on this. Bigger factories tend to be less flexible, more expensive, and less interested in unproven product concepts. However, there are two problems with relatively small manufacturers in China. The biggest risk is that they show their inability to manufacture at the right quality standard. Good communication and development skills DO NOT correlate with good manufacturing skills. The second shipment is bad too (there is an 80% chance that the second shipment is no better than the first one). The discount means factory managers don’t care about the second order (no profit, no attention). In case the product sells well, can the original manufacturer follow this growth? In the consumer electronics business, volumes can be multiplied by 10 over a 6 months period, and production delays are very, very painful. Unfortunately, most factories are unwilling to invest in new equipment and to hire tens of new people without clear long-term visibility. What if your version 1 is successful but your version 2 is a flop? If capacity is insufficient and orders shoot up, subcontracting will be necessary. And guess what… the subcontractor will have to learn how to make the product, and will have to be checked too! If you don’t do it, you are counting on your supplier and that’s usually not very wise. Onboarding a new Chinese manufacturer to make a complex customized product can take as long as it took to onboard the first one… And there is always a chance that they give up if the boss’ priorities shift in the meantime. The key is to get as much done as possible during the first 2 months, while they are still excited. After that period, everything takes longer. 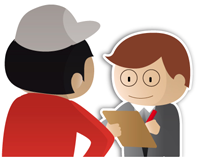 So the buyer needs to have a process for getting all the information to the right people in the factory (not the salespeople) in a short time period. This is hard work. Engineering firms that are based in China can help, fortunately, but few people think of this option. First, one thing should be pretty obvious by now: be pessimistic and don’t believe what you are told without asking at least a few questions. Second, don’t get locked in one relationship. 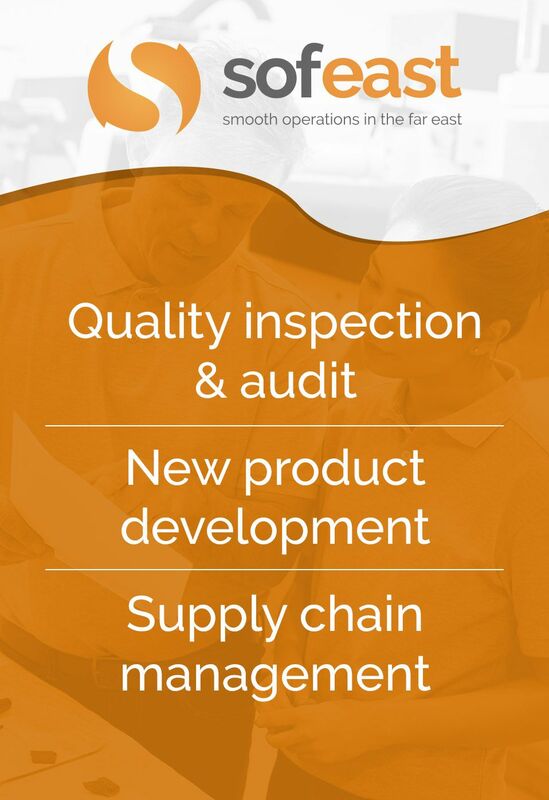 The last thing you want is to start looking for a new supplier while all the product information is in your head. It is extremely time consuming and your current suppliers know this. Not to mention, the re-order deadline might be coming up fast. There are ways to avoid it. Prepare engineering designs, specification sheets, and even a few rough samples on your own if you can. It makes onboarding a backup factory faster and easier. Want to learn more about the new product introduction process for hardware startups? Are you currently starting the new product introduction process, or having some issues getting a product that is being produced in China to market? 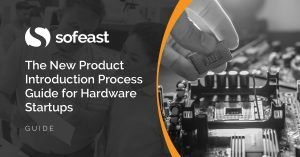 Sofeast’s guide covers everything hardware startups need to know for making a new product in China and successfully bringing it to market. I couldn’t agree more! You CAN’T afford to have just one Chinese supplier. We do most of the “due diligence” that Renaud recommends. (I’m doing most of it myself; but I wouldn’t hesitate to use Renaud or a similar expert.) Even so, we have had several unhappy surprises. One was just what Renaud mentioned: when you complain at a shop which doesn’t believe in quality, you will be branded as a troublesome customer. With this factory, I was spending 2 days at their site investigating a problem (which they denied and blamed us for, saying we hadn’t assembled the item properly). When I proved it to them by finding similar defects in their current inventory, I won the battle and lost the war. They emailed our general manager with a price increase (300%) the next day. It was time to move on. Even in great factories with good relationships you are exposed. We lost one great supplier when one of our customers bought his factory and used it as their sole source supplier. We lost both a supplier and a customer on that deal. Philosophically, I couldn’t complain; had the factory offered the business to us we wouldn’t have bought it. We didn’t have the deep pockets our customer had. One other benefit of 2 suppliers– if you are doing items with custom tooling investments, you can avoid creating a new competitor. Spread the part numbers in 2 factories, and it will be less likely that either would have critical mass and be able to compete with you. So you CAN’T AFFORD to have A Chinese supplier — you need at least 2! Thanks Brad. Very interesting. I love the story of the customer that buys the supplier! All i can saa is: your talk is full of (hard earned) experience in china business and my 10 years experience as a buyer from china tell me that your advice can really be a safety net for new buyers in china. 3/ what you are promised or what you see is not always what you get. 7/ any time you spend in china even if in a party, restaurant or bar, is a time well invested. 8/ going to exhibition even if you think you don’t need, is a time well spent, you may not find a new supplier, but being there will send a very good and powerful message to your current suppliers and time will prove this to you. 9/ studying the basics of Chinese language and culture is a highly rewarding idea. Ameen, thanks a lot for sharing this. I agree with every one of your golden rules!! I take the same view with you. It’s quite necessary to have one or two backup factories in China. Here I would like to share why there are so many problems in the factory. I had been working in a company which is mainly dealing household plastic and small household appliance. This company owns 4 facotories and 13 branches in China. And it’s been running for 30 years. As a salesman in the factory, the worst thing is not that you can not get order. The main issue is that after you get the order but they can not finish it. What a shame for me. I know my buyers will lost a lot if we can not ship them on time. Here comes the reasons or you can say excuses why they delay the shipment. First, raw material delays. It’s true and sometimes unavoidable. As a factory, you need to get raw material from others. Without that, you can do nothing. If you want to get better price, sometimes you have to go to small factories to get raw material. And small factories always has problems. Another thing is if the factory does not make payment on time to the raw material factory, they may do something. Second, the management of the factory. As we know, there are many factories in China are family owned. So some relatives who are not so capable are put to the important position. It seems that the salesman’s relationship with the boss or factory people effect a lot of the production. Anyway, I find it’s impossible to trust the QC of the factory. Only by going to the production line to do the random inspection yourself, you can relax yourself. You can not imagine that one model they have been producing for more than 10 years will have quality issue. And the thing they do is not correct it but ask you to persuade your customer to accept them this time. So never count on them. And you should also check when raw material will come, when they will start assemble work, check the production record, etc. Even those small things like cartoon box, printing, you should pay attention too. What I leaned from the factory is, any stupid things may happen if you do not keep an eye on it. Here’s some suggestions for the buyer. 1. For the trial order, place small quantity order to at least 3 factories. Send someone to do the factory inspection. 2. Keep trying to find new suppliers even you have good suppliers already. You may get better price and better products. But of course, if you have time. 3. Do not just concentrate on the price. Trust me, ask more factory for quotation. If you do want to go to the lowest one, visit the factory. 4. Salesman is important. If he is good at communication, he can help to solve many problems. He should think about in your position. Hope above things can help. All of this is good advice. Thanks Leo.